We still haven’t put up our Christmas tree. I know, it’s like over a whole week into December already and compared to most, we are slackers. The truth is, we haven’t put it up or even decorated yet on purpose. This year we are putting it off longer than usual and the reason seems to be sinking in pretty deep for all of us. We used to get crazy the weekend after Thanksgiving and deck the halls, then like most people who have been strategically living around a big ol’ spruce in the living room, the day after Christmas it’s gone! Not this year though. And not likely in any year to come. Over the last several years we have put off the tree until closer and closer to Christmas day. It goes up later and it stays up through the Christmas season in the Church which actually begins on Christmas Day. Then we celebrate and savor it. It feels like we’re just beginning to enjoy the season when the rest of the world around us is bidding it goodbye for another year and collapsing into a post-Christmas food/gift coma. This year we are really taking Advent seriously. We are preparing the way for our Lord with prayer, mediation, contemplation, and penance. We are studying the lineage of Jesus’ family back through to Jesse. We are reading the nativity story daily and thinking about the awesomeness of it all. We are lighting candles on our Advent wreath every night for dinner and singing our desires for Emmanuel to come and be with us. We are tearing a link off of our Advent chain and praying for each of the intentions written there. We are preserving the quiet days in anticipation of that miraculous birth. We are not waiting for Santa. There are no creepy elves wreaking havoc while we sleep, hoping to make the kids be good. We are not running around in search of “the perfect gift,” or stressing out about all that we should be doing. We are waiting patiently for the Lord. I hear people stressing about finding time to decorate and put up their tree, finding the perfect gift, spending too much money, the gifts their kids just have to have and it makes me sad. We find so many ways to add distractions to this simple celebration that the true meaning is beyond lost. In my heart I wonder why so many people even celebrate Christmas at all when they don’t make time for Christ any other day during the year. I hear people say that Christmas is about family or it’s about the memories and the traditions. And it is, and those are nice. I always did find it odd that people who don’t believe in Christ celebrate this day. My point is, what is the point? If we don’t acknowledge that Christmas is Jesus’ birthday than what.is.the.point? If it’s all about family, memories, cookies, and gifts, than why not celebrate it some other time? 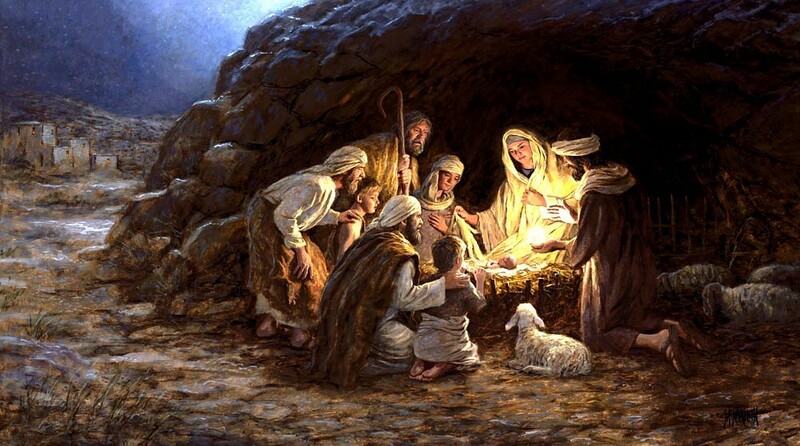 If Jesus had never been born, Christmas would be just another day in December. But it’s not. Because He was and is and always will be. In the Old Testament, the prophet Isaiah predicted what was to come…..
Then in the New Testament, Jesus came to fulfill the prophecies…. Because the God who made us, had pity on us, and came to live right down here on this sinful earth along side of us. He came to save us from that sin and to teach us the way to eternal life with Him. I wonder how we make God feel when we insult Him with what we have made his birthday into. Ouch. There is a “reason for the season” as the old cliche goes. That reason is not family, it is not Santa, it is not so many things that have pulled us so far away from the whole point. The point is Christ. Without Him, none of it matters. Categories:	Advent Catholic Christmas holidays Misc. Beautifully written, Maria. I couldn’t agree more. Wishing you and your family peace and joy.